REVEALED: A way to eliminate all that repetitious form filling, ensure you never have to lose track of another useful site again and make running your online business more efficient than ever! Are you fed up with of boring old eBooks that deliver the same old information? Do you want to start getting real solutions to make managing your online activities easier? Would you like to discover ways to make the most of a truly useful tool that will save you time and work to manage your online activities? Well I can show you everything you need to know to free up your time and manage your passwords and personal information for online use with RoboForm! Make Managing Web Forms & Keeping Track Of Passwords A Breeze! Now there's a way to make registering online for memberships, creating and remembering passwords and keeping track of URLs easier than ever before! Let’s face it: These days we have an overwhelming number of passwords and details we must remember day to day! Each and every time we find a membership site we like we need to register details, remember new passwords, fill out tedious web forms…. It's not surprising that it all starts to become too much after a while…. There's nothing worse than finding a site that has great information and content, only to lose track of the URL and the password you added… If you've experienced this then you know how frustrating it is to manage this effectively! However there are some great tools that will all the hassles out of finding your favorite sites and accessing them again …. If you want to find a way to manage passwords and personal information, then you simply must take a look at this must have online tool! There is one program that can aid you to simply and easily create passwords, manage URLS, keep track of your personal details and even eliminate filling out repetitious web forms! Keeping up with the many passwords and sites that are part of our modern lives can be at times an overwhelming task. We all turn to the Internet for information, to pay bills, to do banking… And we all face the challenges this creates. That means keeping track of the sites we join, the passwords we use to sign in and the usernames we have to create each and every time we register somewhere new online! Let's face it, it can be a bit of a headache! There is a better solution and that solution is RoboForm. When opting to follow my video tutorial series - I'll reveal to you exactly how the RoboForm solution works - and how to make it work for you! Best of all, unlike other dry eBooks or uninspiring guides that just overcomplicate things - my RoboForm Video Tutorials are just what you need to make learning and using RoboForm easy and effective. Many people find using new programs daunting and often the absence of a clear visual guide makes getting things up and running an arduous task…. With RoboForm however - you can do away with these problems! Would the opportunity to learn about this handy software with a visual learning series make you feel more enthusiastic about learning and increase your knowledge retention? What about the opportunity to use the 'bells and whistles' - making the most of the tools and options offered by the RoboForm software. Wouldn't you like to understand the essentials without all that pesky jargon that has caused nothing by confusion in the past? Have you ever found a wonderful site, filled with outstanding information that you would love to read through more closely? Have you then registered with the promise to yourself that you will revisit the site once you have some extra time on your hands? If you have done this only to be lost as to where you found the site, what your password was or where you put the details…. Then you're going to love RoboForm! Now you can bookmark the site and keep your login details all in one place! These days we all have the handy option to pay bills and do banking online… But again, we are often at a loss to remember the many passwords and details we need to make the most of the convenience of modern technology…. Lets' face it - it's not so convenient if you spend 45 minutes finding the details to do something that should only take 5 minutes! With RoboForm - you can make these problems a thing of the past…. And with the RoboForm Mastery Video Series - I'm going to show you precisely how! When I began turning my hand to internet marketing and exploring the internet I was enthusiastic about the opportunities I was discovering online - It was only then however, I discovered the frustration of filling in many repetitious web forms and how difficult it could be to keep track of all the different URLs, logins and passwords of all my favorite sites… I realized that there must be a better way to manage all this information… So I started seeking a solution that meant I could free up time and get a handle on things so that I could speed up a range of day-to-day activities. Finally, I discovered a great piece of software that was perfect for what I needed - when I came across RoboForm I felt like I'd found the answer to my prayers! With this handy little tool I could keep track of sites and passwords - PLUS so much more! Even better than that, I have a straightforward visual tutorial series - a series that reveals how to get the most out of RoboForm step-by-step…. Now you can see how I discovered the way to go from total RoboForm beginner to mastering the program in just a few hours-----And with this great series I will show you how to do the same! Finally a step-by-step system to learn RoboForm - Save precious time and be more efficient than ever before! Learning with these video tutorials is the best option around to really get the nuts and bolts knowledge you need to utilize all the applications available with RoboForm…. Making understanding and using this software easier than ever before! The video format is the ultimate learning options, whether you are a well-practiced computer operator, or a new user. Once you complete this series of learning tutorials, you will have greatly increased your knowledge base and mastered the many applications available with RoboForm. See how quickly you can progress from an inexperienced user to a highly skilled RoboForm operator - speeding up your online work in no time at all! I'll cover all this and a whole lot more throughout the RoboForm Mastery video tutorial series! Want a real solution? My RoboForm Mastery Video Tutorial Series is a system that works! You can progress from a novice RoboForm user to master the system completely! Once you begin learning about RoboForm with the RoboForm Mastery Video Series, you'll discover just why this software is highly recommended for making your online experience easier than ever. PLUS I'll show you how to fully implement a range of elements to make the most of the useful tools that are included in this great little program. If you would love the chance to make the most of your online experience and improve the ease with which you carry out bill paying, web surfing, form filling and a range of other activities - then you're going to love my tutorial program! Even if you are an Internet newbie - if you want to understand RoboForm - then my video tutorials will uncover the step-by-step instructions you need to master this highly useful program. Not only will you be blown away by what you'll learn - you'll be amazed how easily these skills can be applied! Now you can access the perfect solution to help you achieve the timesaving results you wish for - in no time at all! RoboForm Changed How I Managed Everything Online FOREVER! Perhaps you are curious as to why these videos are so useful? We all have our individual way of learning things…. Not everyone has the time and patience to sit and read through an entire eBook - trying to absorb dry information that is often full of hard to follow 'geek speak'! I understand the difficulty that all that jargon can cause. That's why I created an easy, visual program - so that you can get the information you need - filled with user-friendly demonstrations of the best ways to successfully master RoboForm once and for all! Within the RoboForm Mastery Video Tutorials you will uncover an outstanding compilation of information - covering everything necessary to make your online work or activities easier - with one user-friendly program. Throughout the video series I uncover the best techniques and methods available to help drastically increase your efficiency online day to day - so that you can get more done, more efficiently… Saving you time day in and day out! Progressing through each video in the RoboForm Mastery Series, you'll access a wealth of information that will demonstrate the many different ways to make the most of RoboForm and the useful tools that the software includes to make web surging fun and easy! Best of all - with my video tutorials you can be sure that you'll retain more information and understand how to apply what you've learned more effectively! That's it! This truly is the simplest way to master this useful Internet tool! You too can progress from beginner to RoboForm expert in as little as an hour! In just a short time you'll have mastered the tools and options offered by the RoboForm software - making the most of this unique tool! It simply doesn't get easier! In video 1 of the series I'll introduce you to the award winning automated password manager and web form filler - RoboForm. I'll cover the topics of the various videos in this in-depth series to wet your appetite to learn all about this awesome piece of software. In this video you'll learn where to find and download your copy of RoboForm. You'll also find out if RoboForm will work with your browser or if you need to download additional software. This video will explain the benefits of and how to use the Master Password. This is best when configured at the end of the installation process although it can be skipped until later, this should always be done whether you are the only user of the computer or not. In this video I'll introduce some of the major controls or options you can work with inside RoboForm. In video 5 of we will go further in depth with the Toolbar controls of RoboForm. I'll talk more about the Toolbar and the many ways you can access it and put it to use. In this video you'll see how to set up your identity and why it may be a worthwhile having more than one identity set up. This video will show you in detail how to define and use the Custom Fields Tab in Identity. These tabs will play an important role latter in the video series when I demonstrate how to successfully use RoboForm in your day-to-day Internet Marketing. This is a must see video. In this video I'll cover Creating Passcards. Passcards store form data about you that is specific to the web sites you visit - Data like User IDs, Passwords, Magazine Survey fields, etc. You can save any form data you like to the Passcards and use it to Auto (robo)-fill forms later. This video will cover the use of Passcards. The previous video covered ways to create Passcards, now you'll see how to put that information into practice as this video covers ways to use the "already created" Passcards to fill out forms on the websites you created the Passcards for. This video shows you in detail how to edit and better manage all your newly created Passcards. In this video I'll demonstrate the various ways in which you the login function can be used, as well as other options available within RoboForm login function. In video 12 you will learn about the RoboForms built-in Bookmarks function. This allows you to not only store visited web addresses, but also lets you write up lengthy notes and details about that site as well. For those of us who visit large numbers of sites and want a refresher of what the site included, this is a great function that you are going to use often! In this video you will learn how to use the SafeNotes function to keep more of your data secure. This can include sensitive data like your ATM numbers and passwords, your Drivers License Number, Safe Combinations & more. In Video 14 we will show you how to use the RoboForm Search Box. The RoboForm Search Box works like your browser search box on steroids! This super powerful search tool also has enough flexibility to merit its own video so that you can uncover everything this invaluable tool has to offer. This video will make sure you don't end up with cluttered and hard to manage RoboForm files. Get the disorganized side of your brain sharply focused during this video, and make your RoboForm filing problems a thing of the past! This video will introduce you to the RoboForm Password Generator. Use this nifty tool to help generate and keep track of truly unique and random passwords of various lengths and strengths. This is a cool tool if you really want to make your site access super secure! This video will show you one of the most important tasks in using your RoboForm software - backing up your data! What a phenomenal amount of information! I'm sure you are able to see how the extensive content covered is a clear indication of the outstanding value this package offers! Quite simply - there's no other instruction method, training, or tutorials available today that can equal let alone outperform the RoboForm Mastery Video Tutorial series. 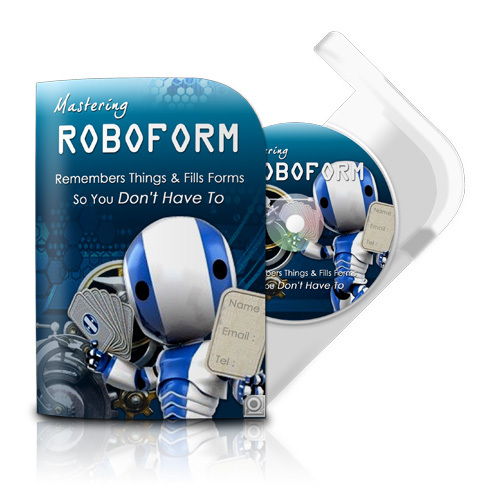 The RoboForm Mastery Series is a MUST Try System That's GUARANTEED to work or it’s FREE! You can continue doing the same as you do now, and you’ll keep getting the same results you do now - over and over again…. I believe that I've created a truly outstanding product - so I want to see you get the best results possible with this learning system. I’m so confident that the RoboForm Mastery videos will deliver results that I’m prepared to back up my product with a full 30-day guarantee. If at any time in those 30 days you're not 100% satisfied - then you get 100% of your money back! If don't genuinely believe these outstanding video tutorials are everything promised, then I'll fully refund your money! Simply let me know within the 30 days that you're not totally happy with the information provided in the series - and I’ll give you a full refund directly from my account - no questions asked! I believe a simple and honest guarantee is the best kind of offer - and I will always abide by it - so wait any longer? Free Up Your Time & Streamline Your Online Business - Start TODAY with RoboForm Mastery! If you’re ready to make your online activities run more smoothly and effectively than ever before - then you must take advantage of my LIMITED TIME offer - that lets you get these entertaining and informative videos for an amazingly low price! I SAY YES to successful learning with this incredible Video Series! It is on that basis that I am clicking the secure order button below this instant! PS: Every so often those rare opportunities come along that we least expect… Today you have one such opportunity staring you in the face… You can liberate your time and take control of your online activities when you grab this chance that is being offered to you today! Remember you'll get my 100% money back guarantee when you purchase the RoboForm Mastery Video Tutorials - so you've really got nothing to lose if it doesn't provide everything promised! PPS: Think how freeing it would be to eliminate the need to fill in yet another online web form or to be rid of the frustration of forgetting passwords! Well now you can put these things behind you! I've the steps to achieve this and so much more in this super informative video package…. You can make a start straight away - even if you're completely new to web design or the Internet. By simply following the user-friendly video series - all the hard work is taken out of learning. 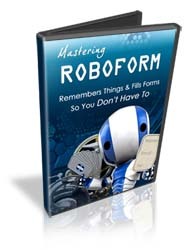 My video tutorials simply take you by the hand and guide you to mastering the powerful RoboForm software quickly and easily! Just one click is all it takes to get started and get on track to success with RoboForm just a few short hours…. ACT NOW and make your goals a reality!